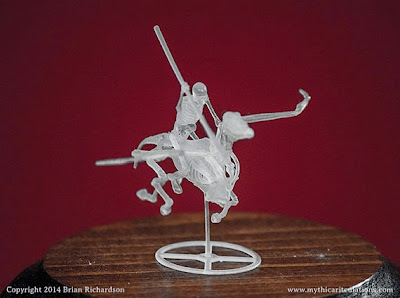 Mythic Articulations has recently released a set of five skeletal Pegasuses (Pegasi?) for use in any 28-32mm fantasy war gaming army. 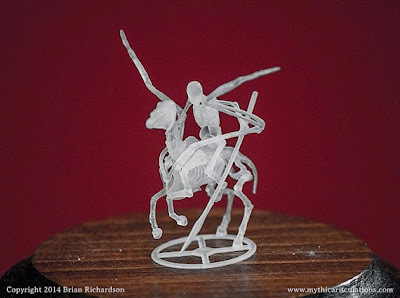 Mythic Articulations typically makes larger display models of “anatomically correct” cryptids – mythical creatures that do not exist in nature. 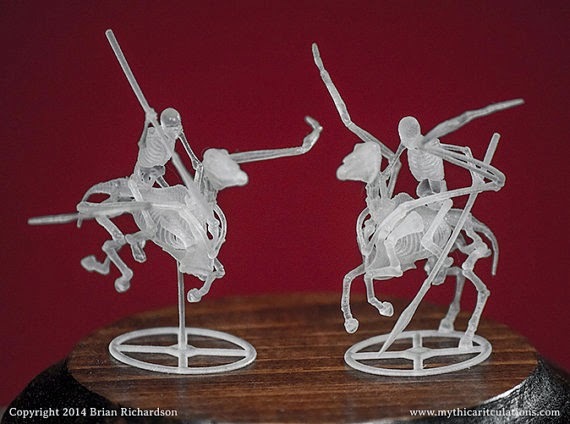 Sculptor Brian Richardson has scaled down and slightly redesigned his original six inch skeleton Pegasus model to produce these figures. Each Pegasus also comes with a skeletal human rider equipped with a spear. Whether you label him Bellerophon or not is up to you! Pieces are individually printed to order and come in two separate poses, one flying and one rearing. They are printed in a high detail, translucent resin and are available from the Mythic Articulations Etsy shop.